Peter Curran travels to the edges of northern Europe to meet the Sami people who have lived on this land for 12,000 years. In the long summer, as they enjoy the 22 hours of daylight in the Arctic town of Vadso, Norway, Sami singers and young reindeer herders share their ancient beliefs and culture. 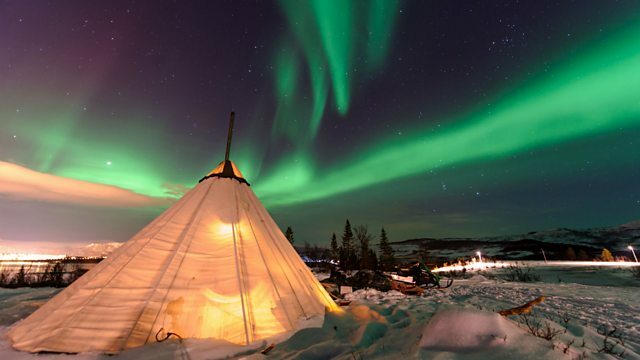 The Sami tradition is that the land, sea, animals and plants are sacred. The gods and spirits within them have been worshiped for thousands of years but today’s young Sami are addressing the effects of climate change, pollution and population growth on their spiritual landscape. The Sami’s wordless spiritual songs – Yoik – which have travelled back and forth along the Arctic Circle as they migrated, are at the core of this programme. The wolf, the reindeer and the parallel universe of spirits beneath the ground are their subjects. The Sami people have been persecuted by Christians for centuries, forbidden from singing Yoik, but now the young Sami are looking to keep their ancient spiritual traditions alive.